The Kremlin, Arbat, and Vorobyovy Gory are on any traditional itinerary for tourists in Moscow. But if you venture off the beaten track, three days is all you’ll need to discover another face of the city. The All-Russian Exhibition Center (VVTs) is the perfect place to spend your first morning in Moscow. It is a giant exhibition complex that at one time showcased the achievements of Soviet life, but is now mostly a large shopping center. And yet the magnificent Socialist Classicist (Stalin Empire style) buildings and fountains have remained almost in their original form. Next to the central entrance is the enormous statue of the Worker and the Collective Farm Woman , which was a focal point of the Soviet pavilion at the 1937 World’s Fair in Paris. Take a look around the museum – which is located in the sculpture’s pedestal – to learn more about the history of the Soviet landmark. 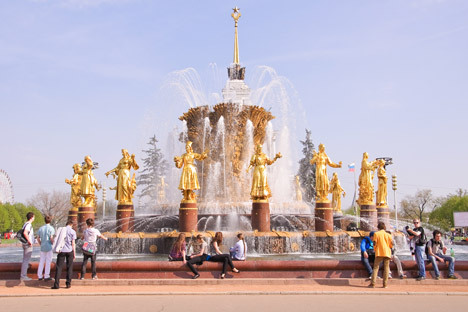 The complex also feature the fountain of the friendship of peoples, depicting representatives of the Soviet republics in native dress. After lunch, head out to Moscow suburb of Lyublino to visit the recently openend Museum of Industrial Culture at 3A Zarechye Street. This is the best place to get acquainted with the everyday life of ordinary Soviet people – from the first five-year plans to perestroika, from automobiles to Christmas tree ornaments. You are allowed to touch and even try on almost anything you see there (go for the hats). If you feel like a bite to eat, there is a kiosk that sells tea and Russian pancakes (blini) in the yard. Back in the city center, take a walk to Krivoarbatsky Lane to admire the residence of prominent architect Konstantin Melnikov – a unique constructivist building formed by two intersecting cylindrical towers. Constructivism was the most popular architectural style during the first years of the Soviet Union, but after Joseph Stalin came to power, it was declared to be “a relic of bourgeois formalism” and banned. Few buildings dating from that era have survived, and most of them are now in disrepair. The Melnikov House has been lucky, mostly because the architect’s descendants still live here. End the day at the Petrovich Club (24-3 Myasnitskaya Street), where you can drink vodka and dance to old Soviet pop hits of the 1970s and 1980s. Start your day in the center of Moscow on Tverskaya Street at the building of the former Moscow Club of the Nobility – currently home to the State Central Museum of Contemporary Russian History, which was itself formerly the Museum of the Revolution. Behind the building, dive into the network of lanes that make up the city's historic heart. Many elegant mansions built at the turn of the 20th century as residencies of Moscow aristocrats have been preserved in the quarters between Tverskaya and the Arbat. After the revolution, many of these buildings were given to embassies or Soviet institutions, which is why the manors have survived. The Central House of Architects currently occupies the palace of the Bazilevsky family (7/9 Granatny Lane), and the residence of the Tarasov family on Vspolny Lane is now home to the Embassy of Tunisia. Notorious secret police head Lavrenty Beria occupied the building for some time, and many Muscovites still believe that you can see his ghost in Vspolny Lane late at night. When you feel hungry, walk towards the Boulevard Ring and try Café Pushkin (26-a Tverskoi Boulevard). Although both the building and the café were created in the late 1990s, this restaurant makes guests feel as if they were back in the 19th century. Start your journey in Kitai-gorod and walk down Nikoloyamskaya Street to Taganka. The surrounding humble, yet comfortable, houses were once the homes of well-off Moscow merchants. At the end of the street stands the unassailable fortress of the Andronikov Monastery. Make a detour here to see the Cathedral of the Savior – the oldest building in Moscow outside the Kremlin – whose walls were painted by famous iconographer Andrei Rublev. The monastery now hosts the Museum of Ancient Russian Culture, which takes pride in its magnificent collection of icons and frescos, most of which have been saved from demolished churches. Turn to short Shkolnaya Street – a tiny open-air street museum, which has successfully reconstructed an old town suburb, with facades, pavements and gas lamps. The municipal authorities at one time hoped to make this street as popular as the Arbat, but those plans were never fulfilled, and many Muscovites are still unaware of this unique street. After your walk, visit the Sandunovskiye Baths (14-4 Neglinnaya Street), established more than 200 years ago and be sure to get an experienced bath attendant to beat you with a bunch of birch twigs. You can have dinner in the same building – the Sanduny restaurant serves traditional Russian dishes. Remember to try the locally brewed liqueurs!